In 1968, Clayborn Temple was home to the Memphis Sanitation Workers during their strike for economic justice. Within its sanctuary they organized their efforts and from its steps they marched daily into the streets of Memphis. As they went they carried the iconic “I AM A MAN” signs that bore witness to the very meaning of the movement: the pursuit of human dignity. 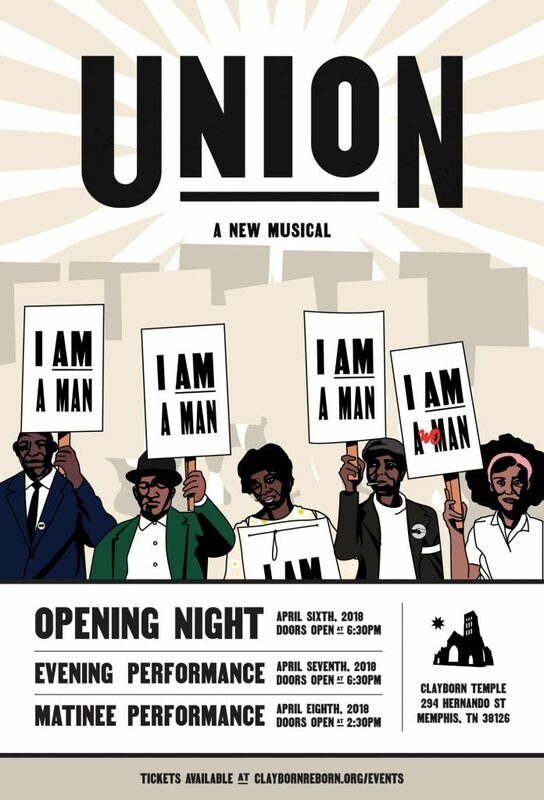 Today, fifty years later, Clayborn Temple is developing “Union” a musical play that inspires audiences with the powerful story of the Sanitation Workers and continues their journey toward social justice. On April 4th, 2018 the eyes of the world will turn to Memphis as thousands gather to remember, embrace, and advance the legacy of Martin Luther King, Jr. on the 50th anniversary of his assassination. As part of this commemoration, Clayborn Temple presents three preview performances of “Union: A Musical” and a community conversation that that brings together community members, activists, artists, influencers, and civic leaders to discuss the ongoing work of democracy in our city and in our nation. Set to debut in 2019, this production will tour cities across the United States and invite audiences into active conversations about the ongoing need for equity, the enduring power of community, and the future possibilities of democracy. African American and Caucasian American actors ages 16 and up for several roles. We are looking for smart, fun and soulful performers with strong musical and physical skills — background in dance or movement theater is a plus. Must be able to sing and rap. Please email Kristen Adele Calhoun at kristenca@gmail.com with your headshot and resume and any schedule conflicts during the rehearsal period.